I can’t be sure what exactly I was expecting out of The Corner Door in Culver City, but I guess it should be known that one of the few things worth traveling to that quandrant for – in my opinion – was ramen, Rutt’s and Roy Choi (even then, I’d still point out that Roy grew up on the eastside of Los Angeles). There have been new restaurants springing up lately, but in a lot of ways, they were neighborhood stops. It seems The Corner Door has found a great balance between being that neighborhood place, and in a lot of ways is heading towards existing as a destination. 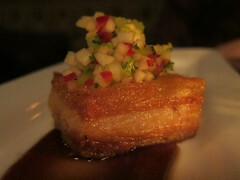 When you have great food and inspiring cocktails, that’s just what tends to happen. In a former life, Cecconi’s was still Morton’s and the site of Elton John’s post-Oscar party, wherein my college girlfriends and I cruised by just to get a glimpse of some major motion picture star waiting for valet. Internally, I made the location die in relevance along with my n00b Angeleno self. Full disclosure: Leave it to a media dinner to allow me to reassess. I don’t valet. I drive a convertible with the top down all the time (now with the weather being warm) that, in what I am sure is a subconscious way of acting out my love-hate-love LA self, I keep so dirty you could write “Wash me” on my rims in brake dust. But let me describe what a great time I had a Cecconi’s. While I don’t comment on service when it’s a media dinner, I have to say that I immensely enjoyed all the cocktails, which had stronger pours than I expected (don’t be fooled by their often pinkish colors). The food was not ground-breaking but appreciatingly solid in their execution. Gin lovers will appreciate this 14 drink menu and some selections, like the Mexican-influeced Jalisco Sour or Picante Paloma, will surprise you. The selection on the menu is especially savvy. There’s variety without the dangers of being overwhelming. Clear categories line the all-day one pager from apps to salads and “Carpaccio & Tartare.” “Charcoal Grill” and “Wood Oven” items are the priciest yet half-portions are available for all the salads and almost all the pasta and risotto. In combination with the tasty, Italian-influeced cocktails, it’s all perfect for a day on the patio with the ladies. 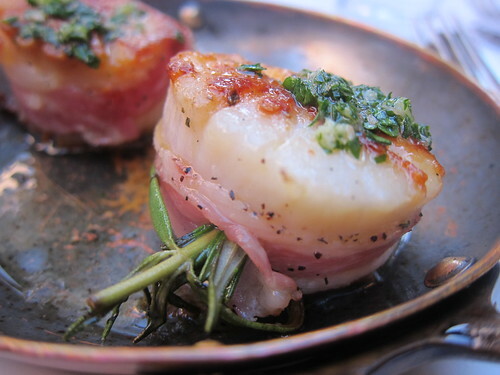 Their most popular items, and understandably so, are highlighted as Cicchetti, which are also served in the middle of the day. 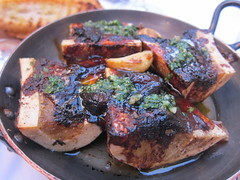 They effectively supplement or comprise your meal, these Italian “tapas” (the scallops and bone marrow qualify as such). But don’t gloss over the pasta (I have a hard time doing so, anyway). Their linguine with clams comes flavored with a bit of sea urchin and the rabbit pappardelle is as solid as any in the city – or even better – as there were generous yet complementary chunks of meat in lieu of the usual strings of meat I often see interpersed between the fat noodles. And it was all al dente. The best part in regards to the pasta is that they’ve just released their Tris di Pasta special on Tuesdays at dinner: Try a sampler of 3 rotating pastas for $18. They’ve also started to feature a different, seasonal pizza with ingredients sourced from the local farmer’s market on Wednesdays. And back on that celebrity tip: Our table, which was positioned on the beautiful outdoor patio separated from the driveway by foliage as is typical for Melrose place, sat next to another who was celebrating the wrap of a certain dance competition TV show while I spied a certain Elizabeth Taylor impersonator at the bar. So that celebrity factor was certainly still there; it just failed to validate my prejudices. It’s rare when I get a full picture of an entire cocktail menu, but it’s even rarer when I’m afforded the opportunity to do so and end up consistently impressed with cocktail after cocktail. 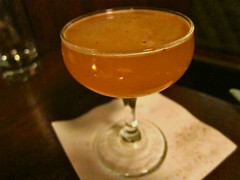 The bar at 1886’s recent Spring menu makes it the destination in not only Pasadena drinking, but a go-to for some of the best cocktails in all of LA. Sure, it flies under the radar because of its location, but 1886 has also benefited as a result. Free of the obligation of appealing to overflow traffic, 1886 has the freedom to focus on seriously fun cocktails, akin to the audience the bar has cultivated since its opening in late-2010. The Pimm’s #5 Cup (after previous other Pimm’s versions with other spirits) is a perfect cocktail to head off the menu for Spring. The rye, Bitter Lemon Fever Tree Tonic and housemade Pimms made for a perfect balance, rendering a super-refreshing cocktail just as a Pimm’s Cup should be. If you’re in the mood for their other rye cocktail, go for the 20,000 Leagues – a kind of swizzle made with peach-infused rye, mint, and housemade yellow chartreuse candy (the garnish was especially tasty!). 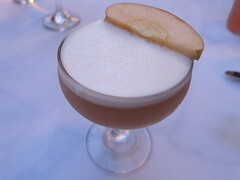 Imagined by Pete Lloyd Jones, this deliciousÂ cocktail was the result of a request by the Pasadena Historical Society to honor residents who were aboard the Titanic. The ingredients were inspired by the Titanic’s own dessert menu. 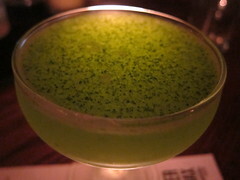 The Water of Life, made by Garrett McKechnie with the Norwegian spirit, Aquavit, homemade Chamomile-Syrup and Noletâ€™s Gin, is the floral tea-influenced cocktail of the season. It’s also a light yet herbal treat and finished off with a sprig or two of Chamomile. 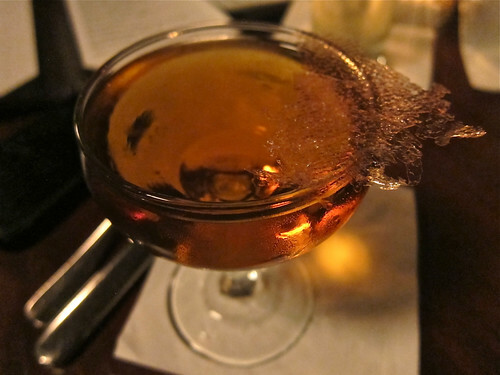 The Cinnablossom by Lacey Murillo comes with a cinnamon garnish that is toasted – or flamed – tableside. Gin, lemon juice and homemade cinnamon bark syrup make for delicious gin-citrus cocktail with a subtle touch of spice. One of the best beer cocktails I’ve had in awhile also happened to be the prettiest, which is quite lovely since it’s a testament to how far they’ve evolved. 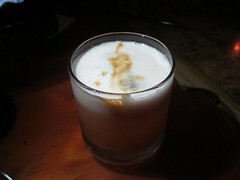 TheÂ Wild Orchid is a shaken cocktailÂ made with Torontel Pisco, Vergano Bianco Vermouth, Grand Marnier and Hefeweissen with the orchid garnish. The effervescence of the beer worked well with the depth of the Pisco, vermouth and Grand Marnier for a really wonderful combination of flavors and textures. 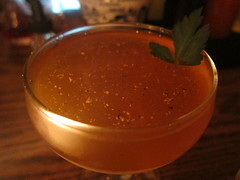 The other flaming cocktail on the menu is the Bittersweet Farewell in honor of former 1886 barman, Danny Cymbal’s. A flaming lemon peel floats as an oasis in a shaken concoction of London Dry Gin, homemade Passion Fruit Syrup, lemon juice and Campari. 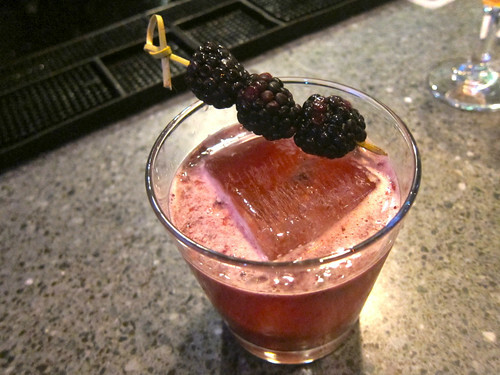 It’s a beautiful gin drink with just the right amount of tart. The all-out favorite of the night had to be the Rum Whistle, which is basically 1886’s new bottled special and bottled each and every night for a fixed amount to be sold at the bar the next day. It’s not only bottled, but it also has the widest range of appeal; boozers and non-boozers alike will love it. The green apple-celery soda base isÂ spiked with aged white rum and finished off with fresh lime juice before being carbonated and bottled and the results are simply tasty. You may order more than one – not only because you can but alsoÂ because you love it. 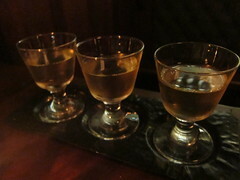 The Vintage Caprice Flight features three vintages of classic Beefeater Gin Barrel-Aged Caprice â€“ made with Beefeater Gin, dry vermouth, Benedictine and orange bitters and thenÂ aged at 4-months, 8-months and 12-months.Â I wasÂ surprised to find that I actually favored the 8 month vintage over the 12. Older isn’t necessarily better and sometimes, your gin is just done aging. The Barrel Roll (title picture) doesn’t just fall under the years-long trend of barrel aged cocktails, it’s also a super tasty rendition of aged Bols Genever, Carpano Antica, Green Chartreuse and aÂ Campari chip byÂ pastry chef Jeff Haines (who also did the Yellow Chartreuse candy). It just so happened to be one of my favorites.Â The chip was theÂ slight sweet touch to the Bols cocktail and made for a strong yet nuanced cocktail. Of course, you’ll need a few bar bites to line your stomach – but the selection at 1886 does more than that. They are daring yet successfully delicious plates, indeed. 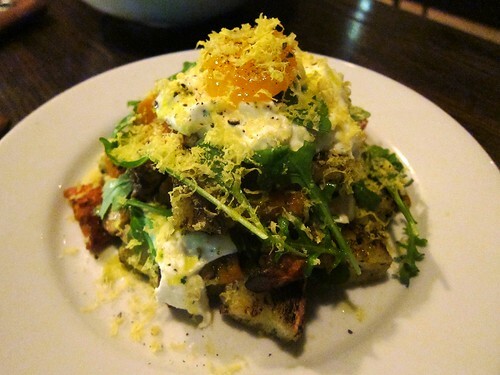 The musts: Shrimp toast and Lamb necks. So get on over to 1886 right away and drink up. 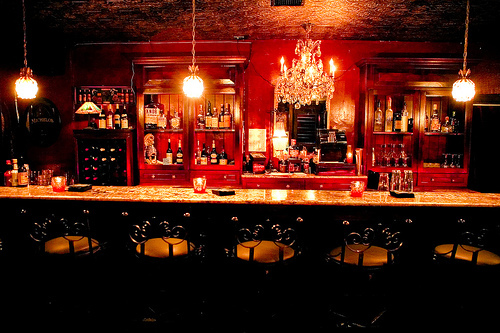 You’ll learn why it’s one of the best kept secrets inÂ Pasadena. All food and cocktails were hosted. Special thanks to Brady Weise. I couldÂ spend a whole week inÂ New York and not get to all the restaurants and cocktail bars on my shortlist. But Booker and Dax was one of those do-or-die bars and well, I’m just glad that I made it back to the East Village on my last night on the island. They’re flashy cocktails, but not purely for showman’s sake. (And what a show they put on.) 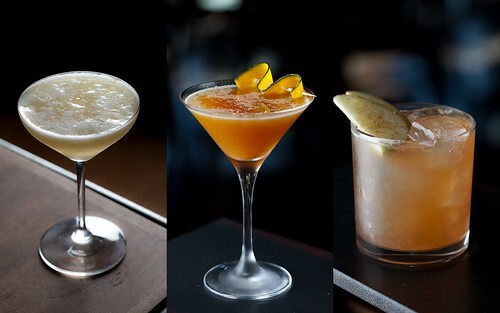 These cocktails are, most importantly,Â delicious – and thought-provokingly so. With Momofuku Milk Bar shuffled across the street for this few months-old cocktail bar, a torch, centrifuge and carbonating-shaker-contraptions (as they are scientifically called) are found on the same counters once occupied by crack pie and cereal milk soft serve machines. Booker and Dax isÂ a collaborative effort by David Chang and Dave Arnold with the latter bringing his brand new methods to the table. 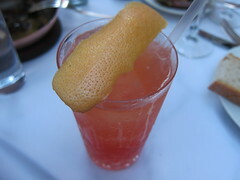 The resulting cocktail menu is one that can be divided into fifths. That is: Bubbles, stirred, shaken, on the rock and Red Hot Poker. And if you’re interested in what you’re drinking in the least, you best be sitting at the bar if only to witness the wizardry of the process. 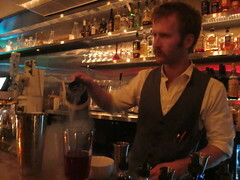 For instance, if you ever thought water and ice was enough to chill your glass whilst the bartender makes your cocktail, think again, because onlyÂ liquid nitrogen does the trick at Booker and Dax. The Lady of the Night was effectively a liquid Bloody Mary – one to be enjoyed all times of the day. Horseradish tincture is in the cocktail, which was created by first muddling fresh horseradish with vodka and then re-distilling it. Sriracha essence? Basically the liquid resulting from centrifigual force enacted upon the infamous rooster sauce. The result was a Bloody Mary full of clarity. No pulp to be found – just all-out flavor. 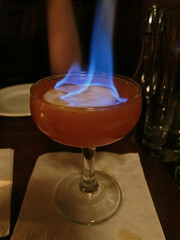 Of course, I had to see the Red Hot Poker in action, so I ordered a Friend of the Devil, or what I’d call aÂ “Torched Boulevardier,”Â made withÂ rye, campari, sweet vermouth and pernod bitters. 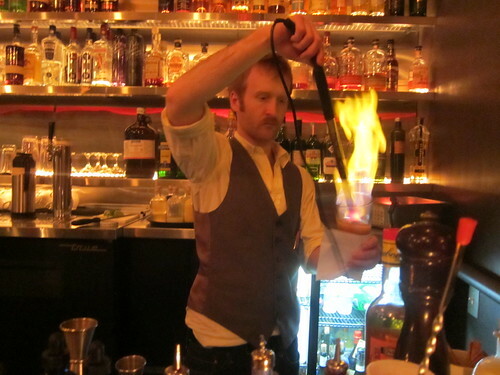 As I was curious if the alcohol might be burnt off as a result of the torching action, Sother Teague reassured me that each cocktail is indeed made with more spirits to compensate. Served in a ceramic cup, the resulting cocktail was warm andÂ comforting with a touch of carmelization to taste. And itÂ was strong. 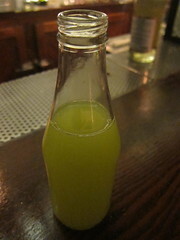 A super simple but delicious cocktail my friend Greg ordered was the Bangkok Daiquiri, made with white rum, lime and Thai basil. Unfortunately, I didn’t get to try any of the cocktails made with carbonation but was lucky toÂ witness a fellow guest’s cocktail getÂ shaken. She assured me thatÂ it was carbonated and delicious. Next time, New York. Next time. I have had four Umami burgers in my life and I have really enjoyed only one of them, which is probably due to the fact that all four were consumed after the quick Umami Burger expansion to Santa Monica, Hollywood and so forth. Thus, I found them to be largely inconsistent. Just last week, I passed the La Brea location and there was a line of at least 20 Yelp reviewers people waiting outside to get seated. I gave the same roll eyes that I reserve for those who drive in to my neighborhood expressly for Saturday night bottle service. But this…”catessen”…is a whole new ballgame. So nothing really prepared me for how much I enjoyed pretty much everything at Adam Fleischman’s UMAMIcatessen friends and family nightÂ in Downtown LA.Â And is the theatre revival on Broadway ever thankful for this pre-performance dining spot, which is basically a 7,000 square foot bazaar furnished with repurposed furniture in the 1929 Art Deco Ninth and Broadway Building. Down the street at a later date we can welcome Two Boots Pizza, Ace Hotel and Clifton’s Cafeteria reopening. The Cure (read: Kosher “style”), Umami Burger, P!GG, Spring for Coffee selections, & a Donut and of course, the fabulousÂ Back Bar all offered tasty treats and swillerific swigs. Top notch. 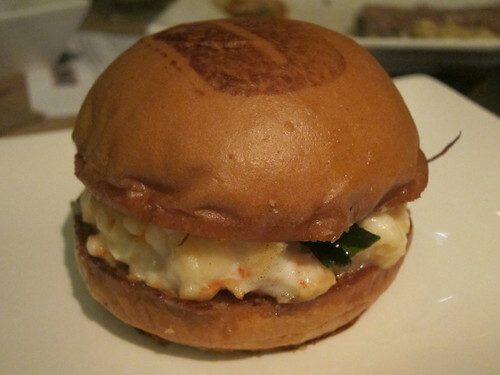 The best bite of the night was the just-unveiled-that-night Shrimp Burger with Yuzu-Kosho, which embodied that namesake fifth taste in every way. No soggy lettuce, mind you,Â sat between the buttery, airy bunsÂ but a bit of seaweed in keeping with that shrimp bite.Â It also packs a delicious,Â slight kick thanks to the yuzu-kosho. 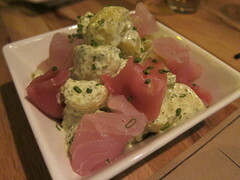 Also exclusive to this location was the ever delicious Wasabi Potato Salad topped with Sashimi. It’s ingenius and probably the most refreshing taters you’ll ever have, but I’d be lying if the sashimi isn’t the easiest thing to pick off the appetizer, with my somewhat guiltfully leaving some lonely spuds behind. But let me backtrack, here. 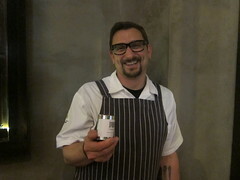 It can’t be overlooked that P!GG isÂ aÂ welcoming of Chris Cosentino, of San Franciscan fame,Â into the Los Angeles foray.Â Don’t forget the Pork in a Can Lardo on crostini nor the Cone O’ Cracklins, the latter of which were delightfullyÂ airier than I expected. The Country Pate with cornichons and green peppercorn was pork-solid, as well, and delicious. And don’t forget the “Brainnaise” (whole hog is key), which comes atop P!GG Style Fries. But at the center of the P!GG menu are curedÂ selections from Spain, Italy and the U.S. 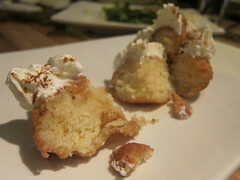 The Mini Potato Knishes from The Cure were also little bits of pastry heaven. The Matzoh Ball Soup is not to be overlooked, either, since there are crunchy little chicken cracklins dispersed amongst the matzoh. The Corned Beef and Pastrami assessment will have to come at a later date. And I would be negligent if I didn’t address the delicious cocktails helmed by Adrian Bigg. 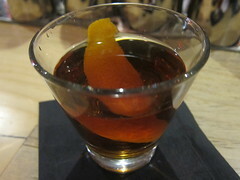 My favorite was the 9th and Broad, made with Woodford Reserve bourbon, Carpano Antica formula, Apricot liqueur and Jerry Thomas decanter bitters. The essential drink, of course, is the Bourbon Pig, essentially bacon fat washed Bulleit with Angostura, sugar and pig ear garnish. 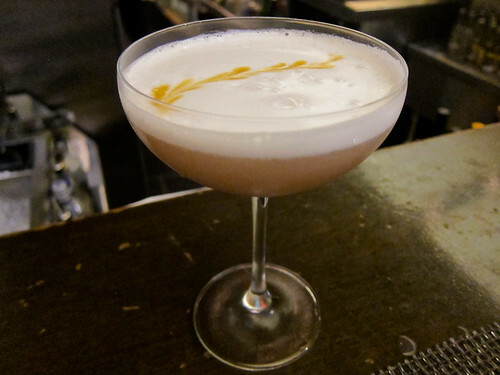 As for gin lovers, I loved the Red Sapphire, made with Bombay Sapphire gin, St. Vincent raspberry syrup, Earl Grey tea syrup, Maraschino, fresh lemon juice and egg white. Don’t judge a cocktail by its cover, as this was a, yes – light, but perfectly balanced cocktail despiteÂ the temptation to dismiss it as aÂ girly drink. So tasty. Feeling more like beer? Ten draft beers are available for your pleasure. And the Spring for Coffee was a perfect, mid-meal pick-me-up. Now that is really good coffee. And don’t forget dessert. The beignets were delightful as was the perfectly moist, rich donut. 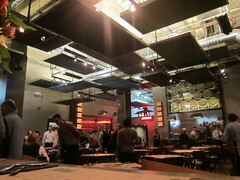 So get yourself down to the UMAMIcatessen. Your appetite for whole hog, burgers, cocktails and all the extra fixins demands it. It’s really not just about burgers, anymore, and at once worthy of all the hype that surrounds Umami. Bone Luging. Have you heard of it? Maybe you have, and maybe you haven’t, but I’m confident in saying it’s the latest, hottest thing in food-cocktail trends. I take food seriously. I take cocktails seriously. Food trends? Not so much. Let’s not confuse them. But I don’t take myself so seriously as to say that I’m so above any phenomenon without closer examination. 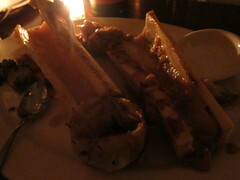 The process is simple: Order bone marrow. Eat bone marrow and leave the bone. Take one shot of desired spirit (aÂ fellow bone luger helps here) and pour down the channel of the hollow bone while your mouth hangs eagerly on the opposite side of the “luge.” (The shot picks up the flavors of the bone during its travels.) Enjoy. A trend that has arisen a few months ago (yes, it’s that “stale” already) out of Jacob Grier’sÂ Portland, bone luging was something that intrigued me because: 1) I love bone marrow. And while I still have a few food-curious friends who are getting acclimated to the idea of it, I always have enjoyed those umami scoops of that gelatinous center. Yes – even without the crostini. 2) I love shots of (key:)Â good spirits. 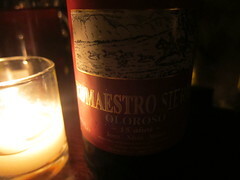 Okay, or fortified wine, if you want to get technical with me, here. Add to the above: The combination of a quality, well-paired spirit with unctuous bone marrow has to be greater than the sum of its parts, no? I guess there will always be the eye rolling haters detractors. And there are the curious mainstream. The health proponents and enthusiasts. And of course, there will be the fanatics and the pros. As they say: Don’t knock it without trying it. And I did, on my recent stint to that other city over there on that other coast – at Prime Meats, one of my favorite restaurants, no less. And it was delicious. I believe the key factor in bone luging being classified as an all-out fad vs. arguable trend is which spirit/wine is used in the shot. Thankfully I was in good hands, asÂ Sother Teague (@creativedrunk)Â poured shots of Oloroso Sherry for my friend Robbie andÂ I to luge with. As Sother explained, since sherry is closer to a wine, it’s sweeter andÂ better than usingÂ a really brash spirit because it works well withÂ the unctious bone marrow taste.Â AndÂ I have to say, theÂ bone marrow really added some fattyÂ finesse to that shot. So where can you bone luge in Los Angeles, fearless readers? Bar | Kitchen in Downtown LA. (You can spy Daniel of Thirsty in LA, Chris Bostick of The Varnish and Zara of Providence doing “Fertreuse” luges here – that is, with Buffalo Trace Single Oak Project 131 & 132, Fernet & Angostoura shots.) If you don’t mind guiding your bartender and accompanying kitchen, maybe even try Lexington Social House – or if you’re brave,Â Wolfgang Puck’s CUT, which is known for some of the best bone marrow in the city. Bone luging is for the brave, not for the shy, because there will be lots of attention and questions! If you’re lucky, you’ll get the disgusted looks. I’m sold on the novelty. Not so much the tequila bone luge shot, though I haven’t tried it yet. 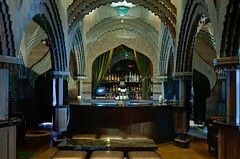 And yes, it’s a novelty, because I’m not about to get mad at a cocktail bar becauseÂ itsÂ kitchen doesn’t serve bone marrow. Just make sure you’ve got the right shot, and if you enjoyed eating the bone marrow in the first place and step, the luge action may make your selection a shot of heaven.